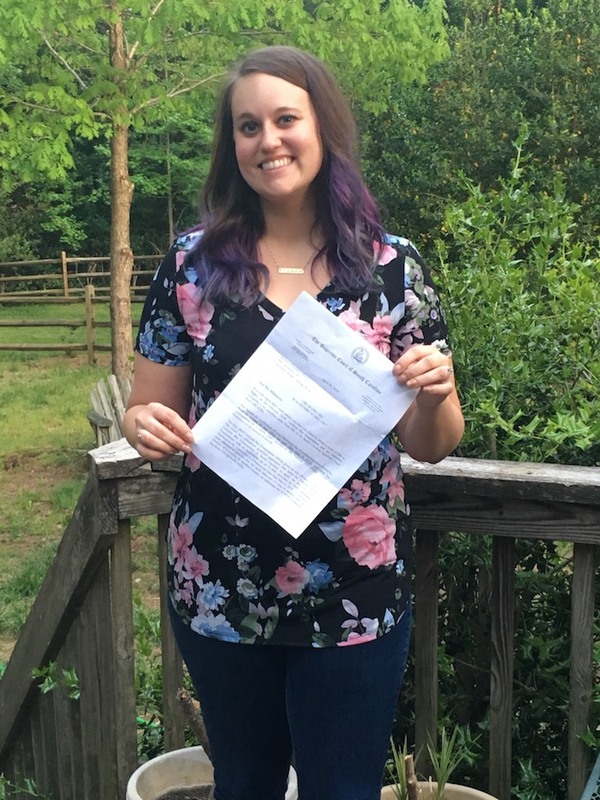 She Passed the Bar Exam on Her 9th Try! Jackson: Hey everybody. Welcome back to hanging out with successful bar exam takers. We have a story and an individual you are going to love. Welcome to Amanda Mill Genomic. Oh my gosh. I tried. I really identify under, you know, did I get it right? That’s right. You know, but really it’s not your name that’s hard to pronounce. It’s the story that you’ve been on because you are now passing the uniform bar exam, bar taker. And what try was this? Amanda: This was the ninth try. Jackson: Okay. Yeah. Folks, I want you to hear that nine tries. This lady hung in there for how many years? Jackson: Five years. And just got your results that you passed and you’ve got the opportunity to waive into, I think five or six states, right? With your score? Amanda: Yeah, DC once I wave into one of those. So six. And then Monday rolls around, so last Monday, and I get the letter from South Carolina that says here’s your score. Well my score didn’t pass in South Carolina, but it was a 263 and passing six other jurisdictions. So I technically pass. Jackson: Okay, that’s pretty exciting. So how are you feeling? Amanda: I’m still in shock. I wake up every morning and ask my husband, is this real life? To be quite honest, I can’t believe it. It’s been a long road. I actually carried the letter around all last week to just keep double checking the score. Jackson: Like it didn’t change the Penn and Teller trick or David Copperfield tricks, number stays the same. Amanda: Maybe I didn’t read it right. Jackson: It’s funny how we train ourselves that way. Well, why don’t we start off with your story and how do we get to this point of being ready to take the exam and your success. But let’s go back and tell us a little bit about the backstory. Amanda: Yeah. So I went to law school in 2010 and I’m actually going to be a lawyer since I was nine. So, it was always a huge goal and I kind of always knew I’d been one of those people that just knew what I was going to do with my life, which is a blessing. Then it kind of became a curse because I couldn’t pass the bar. I graduated a semester early, took extra courses during the summer, had a ton of internships in law school and in 2012 December 2012. 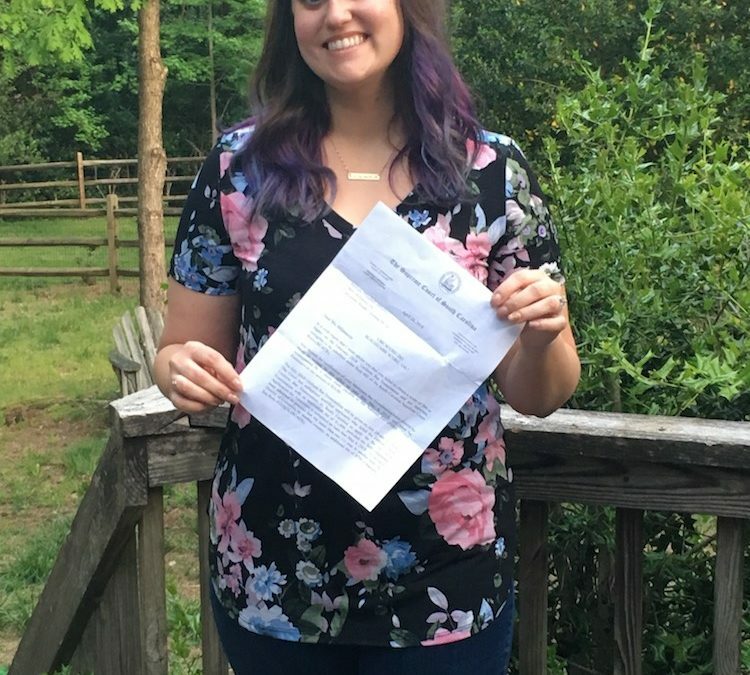 I went to law school in Florida, took the North Carolina bar in February of 2013 for the first time and failed it and was devastated, absolutely devastated. And to be quite honest, I had never failed at anything in my life. Amanda: Which I thought to that point was a blessing. This “just wait”, just been on my shoulders. I was a failure. I graduated early, but for what? For nothing. I failed the bar. I couldn’t do anything, couldn’t do anything in my career. I was working at a large pharmacy. As a sales associate because nobody would hire me with a law degree but not licensed. Yeah. I was stuck in that limbo where nobody, people didn’t want me because I had too much education. But I couldn’t, I just couldn’t find a job. It was a really, really rough road. So then I kept attempting because I said to my husband, I don’t want to quit. I worked my whole life for this. I took the big box bar reviews. Every time I took them up on their free retakes every time. I took one bar review retake from 2013 to 2015. Then I said, “This isn’t working, let’s take another one”. So I took a different big bar box review course until I found you in December of 2017. Jackson: Okay. So, when you found our course, what was it about our course that stood out? Why did you decide to make the switch? At that point? Amanda: I really, I listened to one of your webinars. It was the last bar exam you’ll ever take. Yeah. And I wanted that to be me. So that caught my attention. I said to my husband, you got to watch this. So he’s not a lawyer, but I said, you’ve got to watch this. It’s totally different. It’s changed my mindset in 20 minutes and to be quite honest, I just needed someone to say it’s not you and it’s not this test, but we can teach you to pass this test because I was so down on myself that I just needed someone to say, let’s take a whole new approach instead of just let’s memorize all this information and let’s just keep doing practice questions and, and let’s keep writing essays. And I mean, the thing was never the big bar box reviews. I wasn’t scoring well in those because I was in those reviews and then they were shocked that I was failing. I mean, I even got a personal tutor in 2016 that I paid a lot of money for and she was appalled that I failed the bar exam again. I think that that was the fifth time and that’s just what drew me to you guys. It was just a whole mind approach. Jackson: Did you ever have a feeling that maybe you should just give up that you should just put it away? It wasn’t going to happen? Amanda: Yeah, yeah, absolutely. About, I think it was my fifth time I said to my husband, “When do you decide that this isn’t God’s plan?” It isn’t, you know, maybe this is my plan and I’m not Christian and spiritual. And I said, you know, this is my sign, my sign from the universe, I can’t pass it. Maybe I’m meant to go do something else and help people in a different way and maybe I needed to, to get a grip on that. My husbands actually the one who pushed me to say like, you know, this doesn’t define you and you just, you sure feels like it defines you. Jackson: So how did you sort of rediscover or discern that it, your path was still to keep at it? Because that’s a big question. It’s a question that comes up an awful lot for folks. And I want to dive a little bit deeper. I know it’s really personal, but, if you don’t mind sharing, I mean, what was your discernment process at that time? Amanda: Absolutely. So I looked at that huge pile of student loan debt, and had just decided that I couldn’t let that pile up. It wasn’t fair to my husband who married me during law school. He knows going to go to law school would give me a lot of debt. It was a conversation, but I just decided it wasn’t fair to saddle him with all that debt and that’s not the way he views it, but that’s the way I had viewed it. And to be quite honest, I did know that I’m supposed to be an attorney. I knew that’s what I am supposed to do and I thought God’s not going to bring me from high school to four years of college, two – three years of law school and then take this bar for five, six times to just leave me here in this, in this interim space. It really just clicked one day and I said, I’m just going to keep trying something different every time until I can get this right. Jackson: I’ve had students say to me over the years that they felt like there was this higher calling in their life, but also that they came into their lives, for sort of strangely, and that, that was the piece, you know, that seemed to be missing. And I’m always pretty amazed by that and humbled certainly, but I have a feeling that, that more often than not we might be that answer to prayer, that the people are like, I just need to find something. And there may be somebody watching today who was saying, I know I need something and I just want to encourage them. We’re not right for everybody. But, there are a lot of circumstances where somebody’s listening and hearing and viewing things differently can say, oh, you know, maybe that makes sense. So I appreciate you sharing that. Amanda: The way I actually found you guys on that Webinar is through podcasts. I haven’t been a huge podcast subscriber and I was just looking for bar review podcast because clearly the big bar box review lectures I had watched them. All right, so I’m doing what they keep telling me to do, but on repeat because this was my fifth, sixth, seventh time, so I’ve seen all this information multiple times and so I started looking for podcasts on my own and found your webinar and then found one of these interviews on the site. Jackson: Yeah. So in here you are right now. That’s a pretty cool feeling. Well let’s get into the studies just a little bit. You registered for our basic coaching program, which is our most economical program. So you didn’t go all in, you didn’t buy the high level tutoring or any of that, but you did add the Photo Reading piece and I’d like to ask you about that and what that meant to you and what you thought about it. Amanda: I did add on the Photo Reading piece. I loved how you and the course tells us to, you know, when you get in the bar exam to photo read your MBE questions because people would get freaked out and it just kind of made me laugh inside. It gives you a good laugh, you got to keep your sense of humor in all this. So, I loved that. But the photo reading course teaches you basically how to open your mind and then take in all the information on each page at one time. But quickly I’m talking 100 page outlines in 20 or 30 minutes just flipping through when it would take me hours and hours after my full time job coming home to read those outlines and memorize them and study them and highlight them and all of that craziness. So that was one huge time saver, but I also think that because you were able to take it all in at one time, I just recalled it a lot easier and a lot quicker. Jackson: Were you able to finish all hundred questions on the MBE in three hours? Jackson: That hadn’t happened to you before, right? Amanda: No, I was using all full three hours. I was finishing the 100 questions in each session, but I was using literally every second and then going back and changing my answers if I had time to do it on the exam. Jackson: When you were writing your essays, how’d you feel about knowing the law? Amanda: Oh, it felt it felt natural, it just kind of came out and I wrote, I did the MPT and in the essays as well, and it felt so logical the way that you teach us to write and structure those essays, you know, versus the direct method and it just kind of flowed better if that makes sense? Jackson: Perfect sense. So you’re studying differently, you’re using photo reading, were you mind mapping at all or were you just taking notes? Amanda: Yep, Yep. I was mind mapping. Jackson: Okay. So mind mapping is kind of a weird thing too, isn’t it? It’s like drawing pictures and more pretty pictures and then more pretty pictures still. Then you’re going back and reviewing those, the other thing that you were doing that I thought was really noticeable was that you were an active participant in our private Facebook group and in our group coaching calls. Can you talk a little bit about that? Amanda: Yes, absolutely. So when I did the other bar, a big bar box reviews, I didn’t feel like there was any support. There was support from the proctors and people that were grading your essays. But there wasn’t support and communication between people that were taking the bar exam. I went to law school in Florida and then moved back to North Carolina to the North Carolina bar exam. 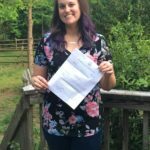 So I didn’t know many people that were taking the bar exam in North Carolina. And then all my friends, by the time had passed. So I didn’t have anyone to kind of commiserate with. I don’t mean it in a negative way because the community with the study group on Facebook and then with the group coaching calls is very positive, but there are those moments where you can be like, I can’t study another question, I can’t look at another essay. I don’t care what the rule against perpetuities I’m done, you know, and everybody feels that way. And it’s nice to know that if you’re having a freak out on a Saturday and saying, I’m never going to pass this, I can’t do this, that there’s someone in that group that I made friends from in, in our study group from California, Texas, Florida, New York, everywhere you taught. I mean everybody is all over. Jackson: Yeah. I heard the virtual cheer when you passed. It was a big deal. I think that’s an awesome thing. I think it’s a very positive thing because it is, it’s an isolating experience and it feels very much alone. And in your circumstance, which is a typical one for people that are repeating and it feels like everybody else has passed you by. You know, we talk about getting your life back. I think for a lot of people it feels like your life is on hold, in whole, you know, the only thing that’s not on hold are your bills, but you know, everything else is on hold. And so you feel like being able to share that with other people, that get it, get you don’t get that out of your system a little bit. Makes a difference, doesn’t it? Amanda: Yeah, absolutely. And that’s what I was just telling one of my girlfriends that is a repeat bar taker as well, you know, it’s one of those things that you don’t understand the support that you need from other bar takers until you have it. I didn’t realize that that piece was even missing because you’re like, well, I can call the practice at any point, what have you. The proctors aren’t taking the bar exam again, you know, and they’re not taking it for the ninth time. Those people in the group that we’re friends with and that you commiserate with and lift each other up. I mean, I have never been more proud of people that I have never met in my whole life. I’m just so many people that were passing this week and last week and I was just so excited. I’m like, please just let me be one too. Jackson: It’s a pretty amazing thing and I got to say from our perspective, we watch it on the sidelines because we know the backstories and were like, “Oh yes! !” So when you passed, when I say there was a virtual cheer, there was, on the slack channels, on the back end, my staff is going crazy. I mean, they’re like, oh my God, yes!! I mean, all of a sudden my computer’s just flashing, you know. That’s pretty awesome. I want to talk a little bit about the strategy we employed a because one of the things that, that we decided to do early on was to switch you out of North Carolina and get you into the uniform bar exam. Now it happened to be that South Carolina was the easiest place for you to sit for the exam. And I think sometimes people lose sight of this fact. Jackson: It doesn’t matter where you sit for the exam with the uniform bar exam, you could have gone to Colorado or Minnesota, you could have gone to New York, you could have gone to. I mean there’s a lot of places, right? So people kind of get. Yeah. And another three coming on board. So sometimes people get this in their mind, you know, I’m sitting for the South Carolina bar. Well, kind of, but you’re really sitting for the uniform bar. So you took it in South Carolina. and it’s a two day exam. It’s not state specific. So it’s a very different experience than you had in North Carolina. Right? I mean, the test is different in that sense. The MBE is the same performance tests, but the essays are certainly different in a different approach. What did it feel like? Well, actually, let me back up. Why did you like that strategy? What was it about that strategy that made sense to you? Amanda: So it made sense to me because what’s the definition of insanity? Doing the same thing and expecting different results. I was changing on my bar course. I was changing up, you know, the jurisdiction because I needed something different. North Carolina clearly wasn’t working and their passage rates truth be told are continuing to go down. I just said we’ve got to do something different. And so when we decided on South Carolina, to be honest, I mean that opened up a whole new ballgame because if I pass the UBE even, you know, if I did pass in the six jurisdictions, I mean, look, if I had passed in North Carolina this time, it’d be only one state. Jackson: That’s it. One which is kind of hard to pass. And suddenly you start going, oh, okay, I can do this, I can do this, I can do this. Your score for the UBE was a 263, correct? Correct. Okay. That’s a pretty good score. I mean, that gets you into six jurisdictions. It probably gives you enough that you could sit for the Florida only part of the Florida exam if you were crazy enough to do that. Yeah, talk about crazy. But it gives you this opportunity to be licensed now in those jurisdictions. And does it really matter all that much where your license is? Jackson: Yeah. See, that’s the point. And I think a lot of folks kind of lose sight of this. They think I have to be in this state only. But the truth is that the way laws being practiced today, if you are a member of the Minnesota bar and you’re living in North Carolina, it makes little or no difference for most of the legal work that you want to do. Please tell our audience, how does it feel to have ESQ. behind your name? Jackson: Feels good, doesn’t it? Alright. So I just want to get that out there to folks because I know that the strategy, we kind of pushed the strategy early on and I got a lot of, it got a lot of heat, a lot of pushback from people saying, oh, you got to suffer the one exam. You got to sit there, you got to make that exam. I was like, I don’t think so. I mean, you know, let’s be smart about this. You know, the point is to get over the hill. If you get over the hill, it, it changes everything for people. And you are the next in a very long line over the last few years of people who’ve done just that. And I can tell you the results have been absolutely wonderful for people. They were so fixated on a state and then they switched, got them over the top and it was like, oh wow, you know, the sun is shining over on this side of the mountain. Amanda: And the cool thing about that strategy that we did, that I did with you, is that if I wanted to go and retake it because I want to be barred in, you know, I don’t know New York because they have a higher score, so I want to be barred there. I can go and take the UBE again and I’m going as a licensed attorney. That’s different, my confidence level is just through the roof. So if I wanted to do that I could, but North Carolina allows me to wave in with my Minnesota in four years. Jackson: You see it’s a whole different world. And the truth is you’re only three points off of a New York, New Jersey, DC. You’ll get in New York, New Jersey license right away. So this is pretty amazing. So this was a big jump in your scores. It was a different way of approaching things. And you didn’t have to spend tens of thousands of dollars, right? So take that big box bar reviews. Alright. Sorry I couldn’t resist. I’m having so much fun with your story, Amanda. This is way cool. All right. So you take the exam and a different experience obviously finishing earlier, feeling more confident, all of those pieces. But now you’ve got to go back and wait. And you’ve been through this waiting period a lot of, a lot of times I like to ask people about the waiting period because I think it’s probably when most folks have to come face to face with their greatest fears. Is that a safe statement? Jackson: Yeah, absolutely. So, results come out. Tell me what happened. Tell me what that was like? Amanda: I don’t know why I failed. I felt time was different. I know it was. I worked on myself. We did the daily affirmations. I literally just put them down yesterday. They were on my bathroom mirror there on my entryway mirrors. They were everywhere. They were my car. So I had all of those, you know, I, I really did think I was going to see my name on that past list and then Monday rolls around and I get the letter from South Carolina that says here’s your score. Well my score didn’t pass in South Carolina, but it was a 263 and passing six other jurisdictions. So I technically passed. Jackson: I wanted to share that story. I know it’s a little embarrassing, but I wanted to share it because I want people to understand that when you’re sitting for the UBE, you’ve got to take a broader view and, and I think yours is a great example of that. Yes. It would have been wonderful if you’d had the 266 you needed in South Carolina? Yeah. So your three points off. Okay. Which is not a lot, but you don’t get that, but you get a score that lets you waive into all these other jurisdictions and do what you want to do it. It’s unbelievable. And it just takes a couple days to get it processed through. So don’t lose heart folks. I mean, you know, you got to take this bigger view just as Amanda did and then you start to see it. And I, no matter what words I’m saying here, you got to see the smile and this woman’s face to know that she’s pretty happy with this result. I like that, I like that. This is really exciting stuff. When you figured all this out, obviously your husband, you’d tell your husband, right? What was his reaction? Because he’s been your biggest supporter. Amanda: He had just been the most amazing supporter. You know, the people that tell you, okay, maybe this is the time to quit. That was never him. He said, I know you’re going to pass. He literally tells me you’re one of the smartest people I know you need to do this for you, you know, don’t do it for me. Do it for you. He was actually right, it was a perfect storm and he was a godsend again. So he was with me when I got the news and I’m so devastated on Friday, Monday rolls around, I had to take a personal day from work because the ninth time just kind of did me in for a little bit and I just needed a break. I took the day off work and I was here when the mail came, which never happens because I’m at work and my husband was working from home. Amanda: He got home at 2:00 or the mail came at three and he’s never, we’re never home together during the workday. And he and I took a personal day. He was here working from home. I got the mail open up the letter, sat down on my kitchen floor and cried a good cry and ran into his office and he, you know, deals with clients and it’s usually on the phone and all of that. Are you on the phone? He said, no, no, no, it’s okay. And I said, read this, read this. What does this say? Because I couldn’t even process it. I knew it said 263, but I wasn’t quite sure. Was I reading this right? Was that manifesting the center existed for my eyes playing tricks on me. He said it says 263. He said, that means you can be barred in some jurisdictions. I was like, oh my gosh, look them up. You know which ones. And I was screaming and crying and he, he was just hugging me a week. It was just, it was the moment that I’ve been waiting for, for nine times, five years. It was insane. Jackson: I got nothing, man. Folks, if this doesn’t get you, I’m like, I don’t cry, but I’m about to. Amanda: I’ve cried so much in the last week. I just, I can’t believe it. And you know, we had already told my family, my family, his family, you know, my friends, my attorney friends that have all passed. They knew I was getting the results soon and they check in on me about once a week and said, “Hey, what is it, we know you’ve passed this time”. And they were also sure too, and you always feel like you’re letting them all down, because you’re lettIng yourself down, but you also feel like you’re letting all the people that have brought you to this point in your life and carried you through when you couldn’t carry yourself through. You feel like you have let all of them down. So not only is your life on hold, I put my husband’s life on hold and now I’ve let my family down, his family down and all of my friends. Amanda: I had told them all that I had failed and I just said I’m not taking it again. I’m done. This is clearly a different road for me. I’m not taking it again. And by Sunday, you know, before I got the results, my husband’s like, we know you’re taking it again. I’m like, no, I’m not doing it. And he was like, yes, you are. We didn’t know the score. Then he’s like, you’ve got to be close. You can take the UBE again. It’ll be a different ballgame, you know, call Jackson, call Kelly, get something set up. You can do this again, and I said, I know, I can do it. I’ve got to do it. I’m so close. I can feel it. And then that letter came on Monday. Jackson: I’m so proud of you. It’s a fabulous story. You know, I say this sometimes to people when they’ve struggled to get over the bar. You are exactly the person that I want as my lawyer because you won’t give up. And that’s what I wanted in a lawyer, somebody who fights it, has the passion for what they believe in, has the passion to do what they know they’re committed to doing, what they know they should be doing in life. That is who you want as a lawyer. I don’t think I really want the person that goes, you know, I didn’t really care. I took the bar and passed. Amanda: I get it. I took a week off work and decided I’d go take the whatever bar and I’m like, that’s so nice of you. Jackson: I really want fighters. I want passionate people. And I think you’re, you’re one of those, I know that from our Facebook group. One of the great things is that we have past students who are successful who stick around and offer support. I know you’re planning to do that and I think that’s going to be like an awesome thing. I believe you’re going to be a guest speaker at some of those group coaching calls. Amanda: Yes, I might be on this Sunday. Jackson: Okay. See, there you go. all right. I just want to thank you for sharing your story, for being so transparent and so open about what you’ve done. I think watching your future is going to be really fun because you’re going to be incredibly successful. My experience has been when somebody bursts through, like you have, not only do they get their life back, but they get it back in a big way. There is a manifestation of that. There will be people watching this interview, Amanda, who have failed the bar a lot of times and are very discouraged and saddened and frustrated, and I know they’re going to be encouraged by what they’ve heard, but, but if you’re speaking to them directly, what would you say right now to those folks? Amanda: I would say that ditch the big box and that’s not, you know, I’m not trying to promote you. I’m just saying you have got to give up the big bar box review. I always kind of stuck with them, they offer a money back guarantee if you don’t pass what I mean, that’s great, but when the bar passage rates are 30 to 40 percent in a lot of the states in the United States, I mean, that’s really bad odds that you’re going have to retake it. And I would also say, you know, give yourself a little bit of grace. I have always pushed myself and I had this plan and felt like I put my life on hold and my husband’s life on hold and I would just say, do let go of that guilt. You’re doing the best that you can and you are doing everything that you know to do in your power and that sometimes you have to change it up. Amanda: Sometimes you have to do a little something different. Just like the UBE. Sometimes you have to take a different bar review course sometimes. Maybe. I mean, it could be something as little as you got to study in the morning versus the evening. I don’t know, it’s just you have to do something. But most of all I think you have to find your confidence again. That’s what your course really showed me, is that by doing those daily affirmations, the paraliminals and doing the just the support in the Facebook group doing that kind of stuff really brings you back to wait, okay, I passed law school. I am smart. I do good things for people. I want to do this profession because I want to help people. And you have already come so far and you said that in one of the webinars and I burst into tears and I was listening to on the way home from work and I thought maybe I should pull over, pull over. Amanda: Before I have a car accident, but you have to get to the spot where, where you were. Okay with this point. You said, you know, all you have to do is remember how far you’ve come. And that has just resonated with me because no one had looked at me and said it’s okay to be in this spot and it’s okay to have to take in the bar and I signed and that doesn’t make you any less than so big or box reviews that would really like to name don’t say that they don’t say that it’s okay to be you. Nobody says it’s okay to fail. And to get back on. I just recently told my employer that I have been with for a three and a half years now that it took me nine tries because I was so ashamed. I would say you have to find your confidence and don’t be ashamed. We all have a different journey. So, you know, just have some confidence. A little faith and grace. Amanda: I am so grateful for you guys. You have no idea. Jackson: Oh, well yeah. Okay. So you’re. Now you’re making me cry too. Don’t do that Amanda. Jackson: I want people that I know you’re the real deal and I’m so thankful. I’m so glad that we could be on this journey with you. I’m glad that you were a lead or found us and I know that you will be an inspiration to so many folks. This interview is going to go crazy. I can tell you that right now. I’ve done enough of these that I just know it’s an extraordinary story that you’ve got, but the real extraordinary story is just who you are and where you’re going to go. And so that’s why it’ll be fun. We’ll check in with you periodically and see what’s happening. Thank you again and congratulations. I hope that smile stays on your face for a very long time. Amanda: You guys have no Idea. I’m just so grateful. From the bottom of my heart and whether I found you guys or were lead to you or however the universe brought me to you guys. It literally, when I say you guys changed my life, I’m mean it wholeheartedly. I mean, it literally, you have changed my life and I am just so, so grateful. Jackson: Well folks, I got nothing. This has been so much fun and so great. So to our audience. Thank you for being with us today. I hope that Amanda story has inspired and lifted you up the way it has me. We’ll see you agaIn next time with when we talk to another successful bar exam taker. And for now we’ll say goodbye. take care of everybody.